When two stalwarts like Asad Durrani ex director-general of the Inter-Services Intelligence (ISI) and Pakistan Army’s Military Intelligence and AS Dulat former chief of the Research and Analysis Wing (RAW) get together to share snippets of their journey, ironically when they were sitting across screaming blood as adversaries. It most definitely would get most of us intrigued and leave us asking for more. Lieutenant General Mohammad Asad Durrani better known as Firefox is a retired 3-star rank general in the Pakistan Army and presently an intelligence commentator. Durrani previously served as the director-general of the Inter-Services Intelligence and former director-general of the Pakistan Army’s Military Intelligence. On the other hand, Shri A.S. Dulat served in Kashmir as Joint Director Intelligence Bureau from 1988 to 1990, which can be termed as the most troublesome time in the valley. His interception into Kashmir politics in 1990 was through Shabir Shah, whom he termed as “big daddy of militants”, having international links. AS Dulat then moved to Intelligence Bureau where he was promoted to the rank of Special Director and after that, he assumed the role of the chief of Research and Analysis Wing of India. He was also appointed to the PMO to advise on Kashmir affairs from the year 2001 to the year 2004. Therefore it would be interesting to see two great minds share their escapades of trying to run over each other over these years. Excerpt from their new book The Spy Chronicles RAW ISI and The Illusion of Peace give out some interesting revelations of how military and bureaucracy on both sides though structured on the same lines operate very differently. All of this coming from the horse’s mouth would definitely be an interesting read for readers on both sides. The cover title which reads ‘Illusion of Peace’ hints at covering the emotional, ethnic, historical and political factors responsible for the Pak-India rivalry. The book excerpt talks of the distortion of the balance of power between military and bureaucracy on both sides. The book excerpt released has Durrani giving out candid confessions which may make few uneasy. There is no denying that India and Pakistan have been psychologically obsessed with their assorted mutual conflicts. India-Pakistan conflict owes more to historical and psychological “nearness” than to mere competition for resources or territory. They have fought four conventional wars and regularly try to outpace and undermine each other. Durrani acknowledges the fact that Pakistan is envious of the cordial military-civil partnership existing in India calling it strong, efficient, connected, maintained and functional. He laments the deepening military-civil divide in Pakistan and says it’s deep-rooted which has gutted Pakistan into a political-military doldrum. He says “In our case, we still are not fond of the democratic ways of doing things. Till that happens, politicians and military leadership are to be blamed for spoiling the bureaucratic culture in Pakistan, making them ineffective, forcing them to give in to their demands. It is the old culture that does not want to be changed. Further to this Durrani says that “Our Pakistani culture has developed in a manner that if you don’t like something one would say, tumko zyada pata hai? That is the culture where the boss does not like people with different views”. Once I was part of an exercise with the German army. In the evening we were at the bar with the local command, a sergeant, some officers. Everyone paid for his own drinks. And they all were free to disagree with each other. We are not yet there. Here he indirectly brings out the hegemony of Pakistan Army prevailing within the Army and outside its mandate, which has reduced the people of Pakistan to mute spectators waiting to be whipped by the tyrant dictators. He spoke of propaganda tactics now rampant in Pakistan, how crucial a role media plays in managing peoples perception and how ISI taps on it. He says “ Once a media organization establishes credibility, the agencies start on core objectives: micro-managing, choreographing, managing from behind the scenes, steering the type of coverage, etc. Manufacturing facts, creating an environment for when you go to war, is done with the help of the media. Durrani’s confessions reveal that, for Pakistanis, the rivalry against Indians is driven by a deep sense of being “wronged” at the time of partition, the corollary being a “desire” to compete with and trump Indians at any cost. It’s this bitterly competitive urge that drives Pakistan’s leaders, army officers, and populace to defy India’s obvious demographic, economic and military supremacy. However, while aiming to do just this Pakistan in the true sense lost its global identity. 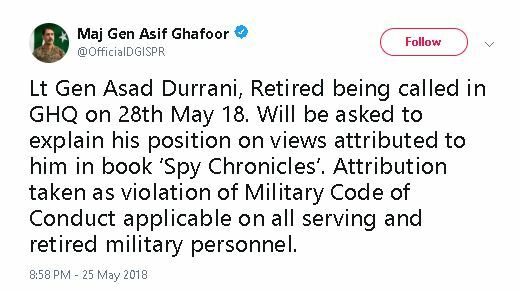 On release of the book, Pakistan Army seems to be caught unaware and have summoned Durrani to GHQ calling it a breach of the military code. However, Dulat so far is not questioned by Indian authorities. If these two could come together to write and share views which is a positive, why can’t others who are only crying foul? He is also denied visa by Indian authorities to attend the book release for which he thanks India and says this has saved him from the wrath of hawks referring to Pakistan Army. Pakistan Army could have questioned its veteran in a more dignified manner rather than splashing “violation of the military code of conduct ” by him and lambasting him all over its media, showing total disregard to the man who was once was at the helm of affairs. Earlier too Gen Pervez Musharraf had written the book In the Line of Fire: A Memoir which had a lot of controversy surrounding it and in fact Musharraf had backtracked on some of the claims mentioned in the book. Similarly, Gen Ayub Khan wrote Friends, Not Masters while still in office. The former prime minister of Pakistan Benazir Bhutto had described the memoirs as a cheap attempt to gain popularity at the cost of Pakistan’s vital national interests. It is wholly in character and hardly surprising that no one accused the above two Gen of giving their own version of history. However, none was lambasted or summoned in the manner Durrani is. The case in point is that he has teamed up with his Indian counterpart to write the book which is totally unacceptable to the deep state.